Andrew of Apollopony.net found this over on a live journal blog. Apparently the postee found it on a CD he bought at a dollar store and redigitized it in all its glory. Not only is it entertaining, it's downright must see. Update: I decided to host it, the original host appears to be dead. Copyrights be damned, this is an issue of free speech. Where else do you get to see cartoons hock Winstons to little kids. Sort of throws a kink in the old "we never targeted kids" defense by big tabacco. Just wow. P.S. I'd love to know where this cool dollar store is. No dollar store I've ever found sells CD's with old ads on them. Couldn't see it. "Quicktime cannot play this file, cannot find software needed on the server"
Is it h264? I heard the audio. Amazing. I've got an old VHS tape full of stuff like this. There are more Flinstones Winston commericals too... isn't it crazy? I love it. bummemhead, Raymond K said the same thing. Yeah, it's h264. Are you on windows? And do you have QT7? I'm really beginning to hat h264, I just want videos the fudging play. My must people freak out about using the latest codecs. This goes to show how much times have changed and our perception of cigarettes too. 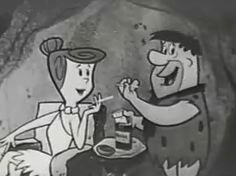 Imagine how much hell would be raised if not only cigarette ads were allowed on TV but they were allowed to sponser cartoons like in the 50's and 60s today. Hi folks. I?m the guy who originally posted the video. The blog entry is here (the LiveJournal thing is just an ?echo? blog. I don?t exactly remember which dollar store I found it in -- I buy those things all the time, and usually don?t get around to looking at them until months later when I have free time. Thanks for posting it dude.